My daughter Melodie's turned two the week before Christmas, but I didn't have time to plan a party (I feel so guilty - I didn't have time to plan one last year either!). However, we had a small party for her at daycare. And since I did Hello Kitty last year, this year I decided to do her second favorite character - Elmo! 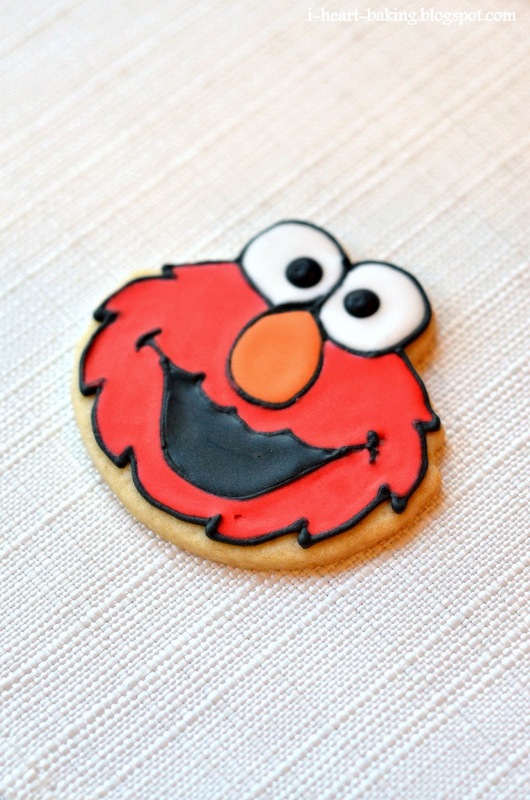 I made Elmo cupcakes for the party (post to come later), and for the favors I made Elmo cookies. 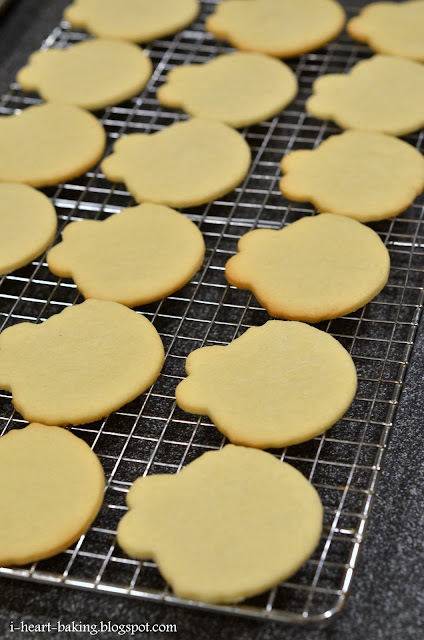 I used this Elmo cookie cutter, and my favorite homemade sugar cookie and royal icing recipes (but you could of course use store bought). 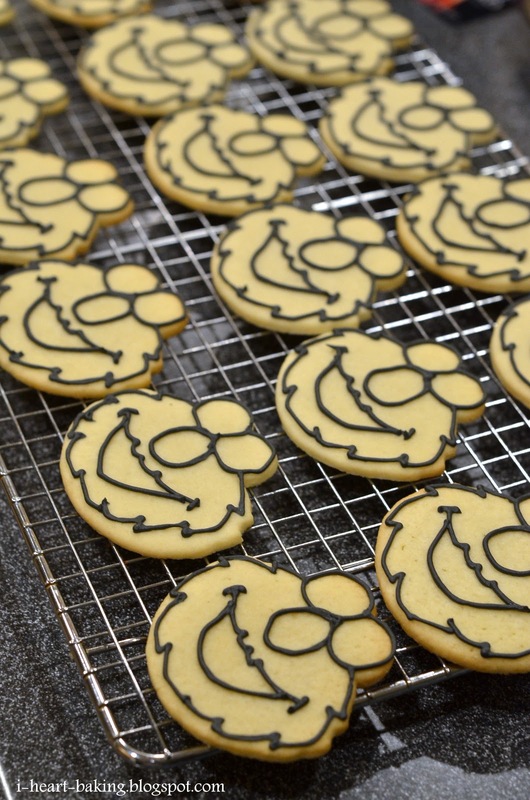 After the cookies were baked and cooled, I used black royal icing to pipe the outlines for Elmo's eyes, nose, and face. When the outlines had dried, I filled in the face with various colors of royal icing - red for the face, orange for the nose, black for the mouth, and white for the eyes. And the finishing touch was adding Elmo's eyeballs. As always, I wrapped the cookies cellophane bags tied with raffia and custom favor tags. Melodie loved them! And so did all the kids (and teachers) in her class! 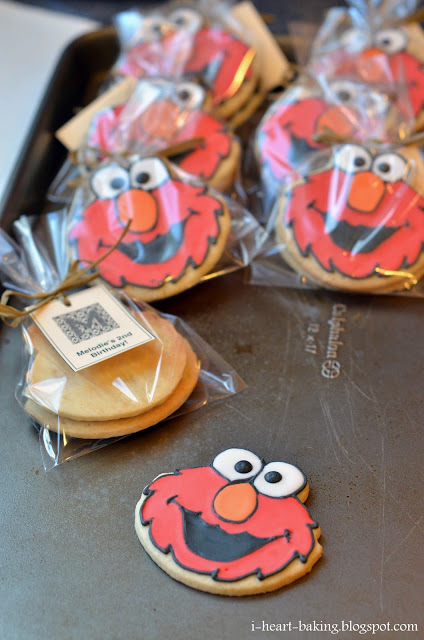 More to come on the other Elmo goodies that Melodie enjoyed on her birthday! *** Update: I also made Elmo cupcakes and an Elmo cake! You can cupcakes here, and the cake here! These are super cute. Happy belated birthday to Melodie. 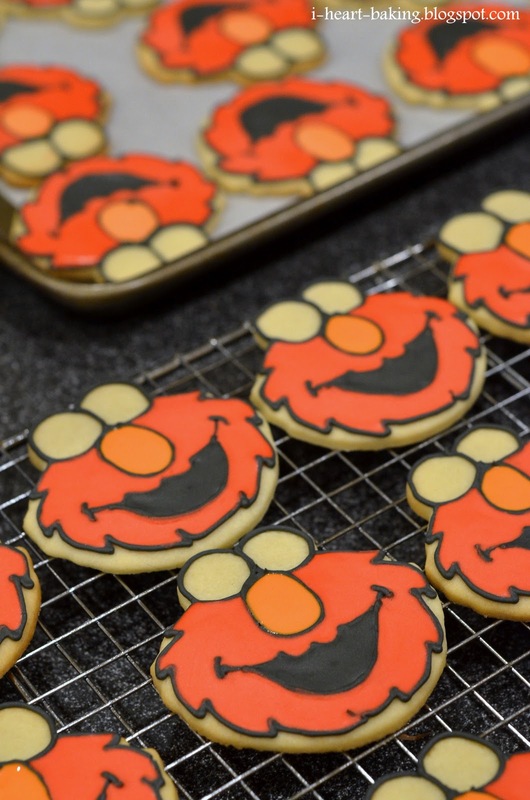 i always wonder... i notice you do the outline piping on the cookies first AND THEN fill it with icing - how do you do that so perfectly?!?! i would of thought you do the icing THEN the outline... amazing! MASTERPIECE! 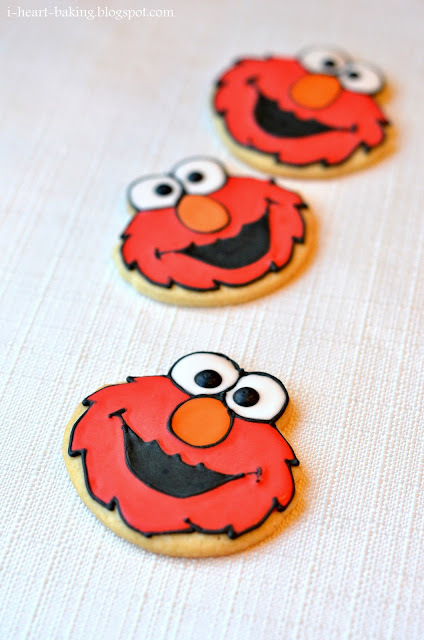 My nephew LOVES Elmo and I would totally make these for him, but I'm intimidated totally intimidated! I love your Elmo cookies a was wondering if you have any problems with the colors running. If not, is there a secret to keeping the colors from running. Thanks for replying. I only do one color at the time and I do wait until the next day to do a second color. I read somewhere that the humidity might have something to do with it, and I do live in a place with high humidity. I will keep trying. Hi, These are awesome!!! What is your recipe for royal icing? Thanks! In how much time in advance can I make these cookies? My daughter's b day is in a month and half and I want to get as much done as possible. @Vanessa Gutierrez - you can make the cookies up to a week in advance! as long as you keep them in a sealed container and store in a cool dry place, they will stay fresh. they will also stay even fresher if you individually wrap the cookies in cellophane favor bags. good luck!